President Rodrigo Roa Duterte might just be the reason why an OFW Nurse is at risk of losing his high paying job. Despite the President’s positive ratings recently on the SWS survey, many are still not at par with his programs and statements. One Filipino Nurse blatantly posts his opinions on his social media accounts, preferably on twitter, about his disgust with the President, his programs and his opinions. This might put him at risk of losing his job as one Pro-Duterte supporter had already been alarmed and had reported him already. 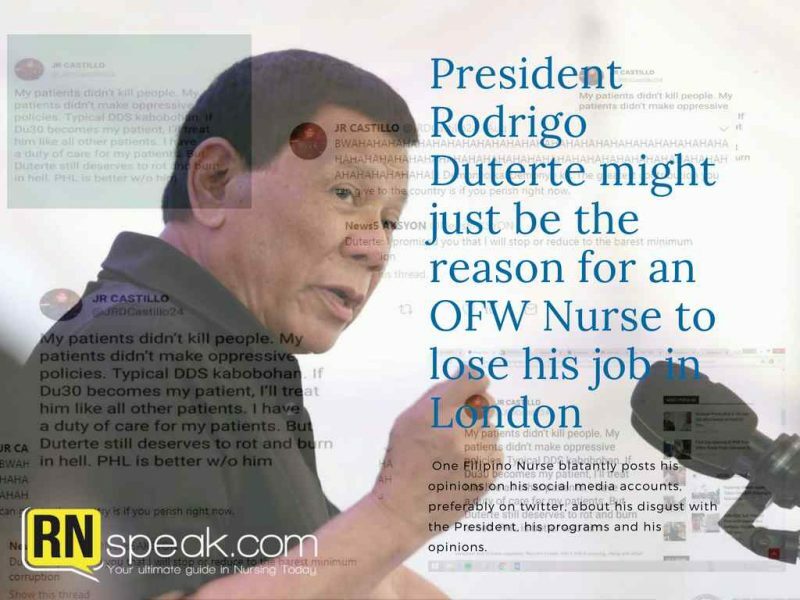 JR Castillo, a London-based Filipino nurse posted not one, but too many posts against President Duterte and his constituents. Castillo, just like Filipina actress Agot Isidro and musician Jim Paredes had never been afraid and will never be afraid to air their sentiments about the government. There have also been claims that some of those who voted for President Rodrigo Duterte already shares the same sentiments as Castillo and seems to doubt his platform “Change is coming” as they do not see any sign of progress presently. 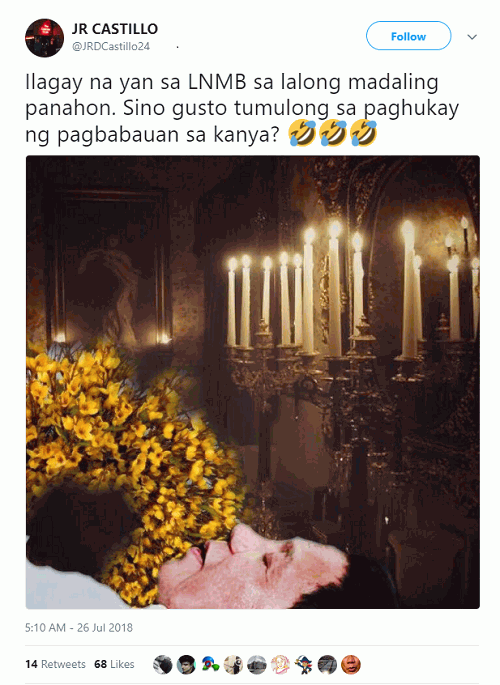 Castillo posted a photoshopped picture of President Duterte which seems as if he was lying down in a coffin and had passed away. This triggered Malcom Conlan, a British national and self-proclaimed Duterte supporter to report him and his posts for mockery and defamation. According to research, Castillo had been holding grudges against the current government of the Philippines. In one of his posts, he said that the President should rot and burn in hell instead. Castillo also called President Duterte an evil and that he should just perish so that the country would gain from it. Netizens were not too amused with his posts and were quick to share their sentiments. Malcom Conlan was not also pleased at Castillo’s remarks. Conlan posted a lengthy post calling out to the government of both UK and the Philippines to take proper actions regarding Castillo. For the attention of Philippine Government officials both in UK and the Philippines. This photoshop image of the president was shared and posted on Twitter by a Filipino, who I believe is a nurse in the United Kingdom, Mr JR Castillo, who I also believe resides in Wimbledon, Surrey. I am very reluctant to post this, as to protect Mr Castillo and even myself from personal harm, however my attention had been drawn to it on Twitter. I am sharing this to protect the Philippine President. I believe I am in my rights to share this as a concerned netizen. I can’t say whether he is just reposting this of or in fact he made it. 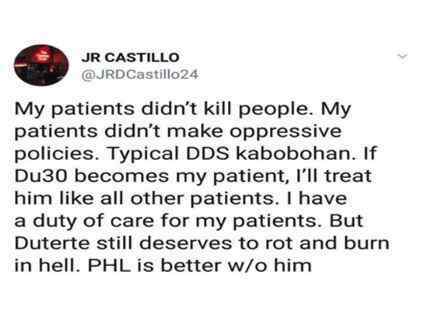 All I can say is that JR Castillo, as a nurse, your job I believe, is to save lives and respect them. Also as a Filipino, I believe you should respect the Office of the President, even if you don’t necessarily agree with all the policies of the current one. To me, President Rodrigo Duterte is a good man, but much more than that, I consider him to be a friend. I find this Twitter post of yours to be utterly disgusting and shameful. By sharing this photo, I believe I am doing my duty as a British citizen, in the hope that this can be appropriately investigated. Much more than that, I am doing this to protect a friend who I greatly admire and respect. 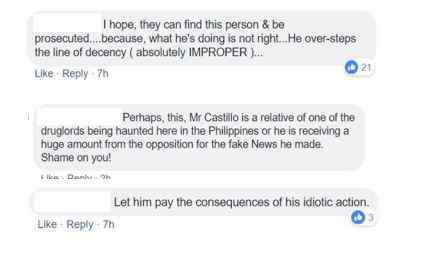 I do hope you don’t have any plans of going home to the Philippines any time soon Mr Castillo, as I believe you will have a lot to answer for. Once long ago, we actually spoke and I offered out an olive branch to you. I now take it away. Your photoshop image of the President and remarks make me grieve for you. To think you are also a nurse in our National Health Service. Shame. God Bless and let’s all continue to protect and pray for the President of the Republic of the Philippines, Rodrigo Roa Duterte. Conlan mentioned on his post that he was at first reluctant to name Castillo as to protect his identity and keep him away from at harm. But Castillo’s actions might have triggered Conlan, thus posting this lengthy post, asking for respect on the policies and programs of the government whether you are a supporter or not. Deportation is defined as an administrative means in which a foreigner who is residing in a foreign country is removed or deported back to his own country after being found guilty of violating immigration laws or may have been declared as a danger to the peace and order of the community. The power to deport a foreigner is an exclusive authority for the foreign country in which he is in. Therefore, only the government of UK may have the rights to say whether Castillo is a candidate for deportation. Article 358 of the Philippines Revised Penal Code allows for criminal defamation, which means people found guilty of the offense can find themselves behind bars. On the other hand, there are list of things that may affect the Philippines Defamation Standards. One is the Freedom of Expression which is codified under Article III of the 1987 Philippine Constitution. Similar to other critics of President Duterte, there are a lot of people who take on their social media accounts as platform to criticize the government’s projects and implementation. These can be taken seriously, or if not, can be considered as constructive criticisms to the current government. As of this writing, Malcom Conlan had been receiving praises for his courage to speak up about the issue, however, he also gained a lot of bashers wherein his pictures were turned to memes and was placed in different kinds of derogatory jokes online. Additionally, JR Castillo seems unfazed about the reports made by Malcolm Conlan. He also claimed to have received a number of death threats from random supporters of President Duterte all over the world. Up to this date, Castillo still tweets about his sentiments, opinions and ideas online about the current government. Who knows one day, he might just be heading up to the Malacanang, face to face with the President to address properly his issues.